- Made of heavy-duty wood and stainless steel, rust-proof, anti-corrosive, durable, safe and healthy to use. 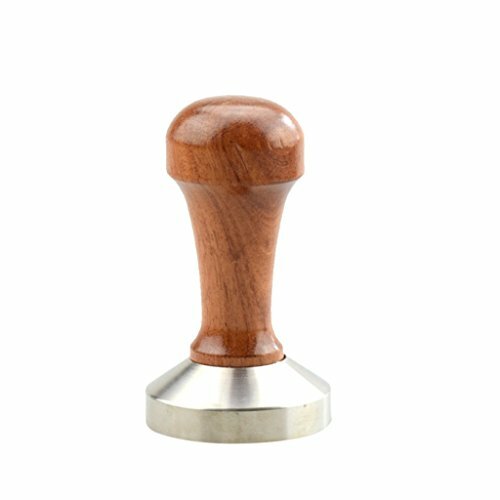 - Unique handle design, very easy to grip and convenient to press the coffee beans. - A must to make a cup of perfect espresso. - Easy to clean, hand-washing with warm soapy water and drying thoroughly. A must to make a cup of perfect espresso. Made of heavy-duty wood and stainless steel, rust-proof, anti-corrosive, durable, safe and healthy to use. Unique handle design, very easy to grip and convenient to press the coffee beans. Easy to clean, hand-washing with warm soapy water and drying thoroughly.